Alliance's Peter Winch and Jess Fanzo join forces to examine the intersection of food, nutrition, and delivering health for all and highlight links to the 1978 Alma Ata Declaration. 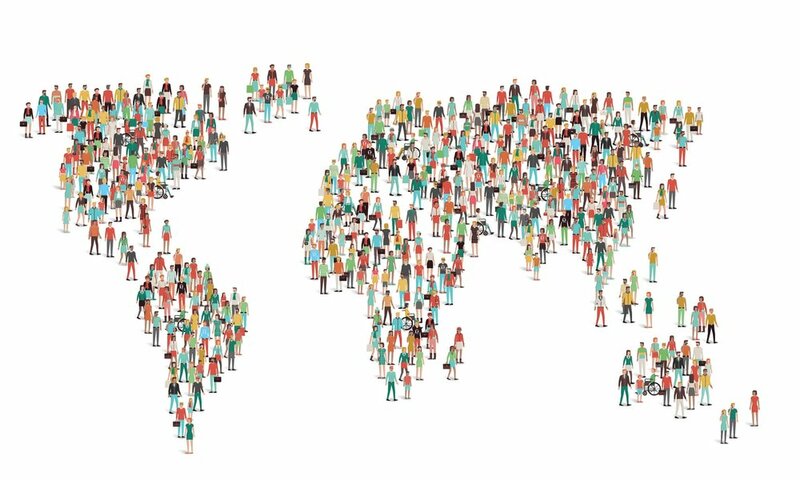 The Alliance for a Healthier World was founded to build on the successes of multidisciplinary collaborations among faculty and researchers across Johns Hopkins, and to support initiatives that promote health equity around the world. To better understand the current work of Johns Hopkins faculty and researchers, we conducted a survey to gather information and gauge their interests in health equity. A whopping 248 faculty and staff across all Johns Hopkins divisions completed the survey during June 2017. One third of the respondents hailed from the Bloomberg School of Public Health, one fourth were affiliated with the Krieger School of Arts & Sciences and one fourth were from the School of Medicine. The remainder were spread across other divisions, including the Applied Physics Lab, Carey Business School, School of Nursing, and the Whiting School of Engineering. This university-wide interest demonstrates the diverse range of individuals with an interest in this common challenge – to address global health equity – a concept that requires engagement from a wide range of disciplines. Given our global focus, we wanted to find out which countries faculty have been working in for their projects. Of the 88 countries and areas recorded in the survey, the countries which respondents most frequently worked in are - in descending order - India, Uganda, China, South Africa, Kenya and Bangladesh. While most respondents reported working in Africa and South Asia, nearly 20% of the respondents have worked in East Asia/Pacific, and just over 10% have respectively worked in Latin America/Caribbean and Europe/Central Asia. JHU faculty are clearly engaged in impactful work in many corners of the world. Created using Infogram (https://infogram.com). View the online summary report for interactive statistics, see link below. Partnerships are imperative for advancing health equity; this complex, multi-faceted challenge extends beyond public health and, so far, has not been accomplished by a single sector. We believe strategic partnerships and cross-sector collaborations are necessary to map out best practices to address what is happening on the ground in disadvantaged communities. We asked the respondents to share the nature of any partnerships they have established. Over 70% have in-country research partners, and about 50% of the respondents have education partners. Many have partnerships with policy stakeholders or networks and civil society organizations (over 30% of respondents, respectively). The survey highlights our faculty and staff are engaged in a variety of partnerships around the globe, and present exciting opportunities for the Alliance to unite groups working towards a common goal. To determine how to best serve the JHU community, the survey asked respondents to rank the types of activities that would interest them. They expressed the most interest in conducting collaborative multidisciplinary research, networking with others interested in global health equity, and collaborating for funding opportunities. Surprisingly, respondents expressed the least interest in receiving training for applying to collaborative funding opportunities and participating in social entrepreneurship challenges – both of which are fast growing sources of funding for innovative, interdisciplinary projects. The survey reminded us that although faculty are interested in multidisciplinary collaborations, the work that goes into making these happen and to be successful are harder to implement and achieve. We are taking this into consideration as we look to how we can better support you, your colleagues and students to lead successful collaborations that incorporate engagement and input from other disciplines. We’re sharing key data in an interactive summary report on our website - please view this for more detailed information on where your peers are working, how they are engaged with partners, and their interests in health equity opportunities. One of the resounding impressions from the survey is that Johns Hopkins faculty across the university are clearly dedicated to tackling health equity. Our faculty know collaborative and multidisciplinary research works. Collectively, we know partnerships are the way forward to making the changes needed for addressing health equity. Our team at AHW have our work cut out for us to engage you in meaningful ways to help you undertake these; we’re excited to lead the charge to work together as a unified force for change. National Academies of Sciences, Engineering, and Medicine. (2017) Communities in Action: Pathways to Health Equity. Washington, DC: The National Academies Press. Graphs and charts created using Infogram. Map created using MapChart. AHW would like to acknowledge Shirley Yan, MSPH 2019 candidate, who cleaned and analyzed the survey data. Following my post on global to local learning opportunities from the first issue of the Health Equity Connector, let’s continue on the topic with more definition and clarity on what we mean by “global.” We’ll use this platform to engage in conversations with you about global health equity and intend for it to start conversations and spark new collaborations. The term “global health” is imbued with grand scale and complexity, weightiness and aspiration. The phrasing is at once invitational and aspirational while also sounding technical and exclusive. Our Alliance for a Healthier World is built on the foundation of global health equity and we consider it our mission to make the concept, and the practical application, available and accessible to all. In other words, we want to explore the many ways you are already engaged in global health and health equity work, whether you use this specific language or other wording. While there are benefits in arriving at a unifying definition of global health, there is also value in the convenings and dialogue on this question that result in new understandings and new learning together, and we are excited to lean into that process. What is global? Must a health crisis cross national borders to be deemed a global health issue? We should not restrict global health to health-related issues that literally cross international borders. Rather, in this context, global refers to any health issue that concerns many countries or is affected by transnational determinants, such as climate change or urbanisation, or solutions, such as polio eradication. Epidemic infectious diseases such as dengue, influenza A (H5N1), and HIV infection are clearly global. But global health should also address tobacco control, micronutrient deficiencies, obesity, injury prevention, migrant-worker health, and migration of health workers. The global in global health refers to the scope of problems, not their location. Thus—like public health but unlike international health—global health can focus on domestic health disparities as well as cross-border issues. In many instances, the challenges we address in public health and in global health are not defined by geography, but by social and structural determinants embedded in the fabric of our societies that profoundly shape our lives. It is precisely because global health seeks to establish causal linkages between the social and structural determinants of health and illness, and the resulting risks to entire communities and populations, that we start to see patterns emerge of similar risk profiles in unexpected places. A frequently cited Kaiser Health News article from 2016, with data from the Baltimore City Health Department and World Health Organization (WHO), looked at the metric of life expectancy at birth within different zip codes of Baltimore City and found an 18 year discrepancy between the highest life expectancy zip code (84 years) and the lowest one (66 years). What a staggering difference! 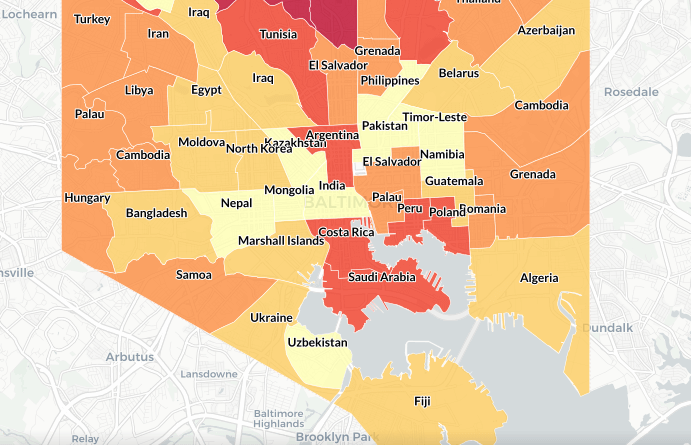 As part of this investigation, the group generated this excellent infographic that overlays the name of the country that shares the same life expectancy with each Baltimore City zip code. At the Johns Hopkins Center for Health Equity (JHCHE), led by Bloomberg Distinguished Professor and AHW Steering Committee member Dr. Lisa Cooper, adverse clinical outcomes experienced by individuals seeking care at the center are also physical manifestations of chronic and persistent poverty and lack of access to socio-economic opportunity. The Alliance has partnered with JHCHE to further understand and design programs to attack underlying social and structural barriers to health. In this partnership, the role of the Alliance is to bridge key findings and lessons from resource poor communities where our faculty work across the globe to the population served by JHCHE and the community leaders who help inform its programming. Stay tuned for upcoming interviews with Dr. Lisa Cooper and her team on this subject. In rural Kenya and Rwanda where I lived and worked, chronic poverty is a feature of daily life and has been for many decades. Because of this, community members, public and private sector entities, have studied carefully the effects of chronic poverty on health outcomes and successfully experimented with public health, financial inclusion strategies and insurance structures to address the poor health outcomes. The government of Kenya began an unconditional cash transfer program to the ultra-poor in Kenya in 2002. Unconditional cash transfers simply mean that the government sends recipient families the funds each month with no stipulations or conditions as to how the money is spent. The nongovernmental organization, GiveDirectly, began operations in Kenya in 2011 to augment the cash transfer program of the government and to analyze program results. The economic and psycho-social impacts of this program are well documented and are sufficiently dramatic to spur new thinking about global health and development work models. In the early 2000’s, the government of Rwanda initiated a centrally planned national health care program to provide universal health access to all citizens. The financing mechanism designed to pay for the system halved the out-of-pocket cost per person, and the healthcare benefits resulted in the steepest decline in child mortality seen in the 20th century. As the U.S. wrangles with questions of new models for healthcare delivery, lessons from Rwanda can provide a case-study for one path forward. In future posts, we will dig deeper into specific examples of the global health programs and mechanisms mentioned above and share interviews with the frontline workers and community leaders implementing these health equity initiatives. We will also highlight the perspective of funding entities in the U.S. that are looking at this question of how best to harness lessons from global health across different settings and bring you voices from this sector. We want to hear from you on this series of discussions about the role Johns Hopkins faculty, staff and students play as leaders, teachers and learners in the field of global health. Please be in touch with us via email: ahealthierworld@jhu.edu. We look forward to continuing this conversation in upcoming publications. Ben Link is the Executive Manager at the Alliance for a Healthier World (AHW). He brings over 15 years of experience working in both the nonprofit and private sectors on initiatives related to global health and development in diverse settings across southern and eastern Africa, Latin America, the Caribbean and Navajo Nation. Good health and wellbeing improves the quality of life beyond the individual – they spill over to families, communities and regions. The Alliance’s bold mission to promote health equity means supporting efforts to ensure that all people have full and equal access to opportunities that enable them to lead healthy lives. We’ve started to tackle this grand challenge by specializing in cross-disciplinary, applied research to understand and seek solutions, and to translate research to engage policy makers and decisionmakers. We do this by bringing together Johns Hopkins faculty and students, as well as partners and communities around the word to integrate scientific, analytic and creative capabilities to advance health equity worldwide. Our Healthier World team identified four thematic areas where an integration of expertise and perspectives is needed to address difficult and inter-dependent social problems. 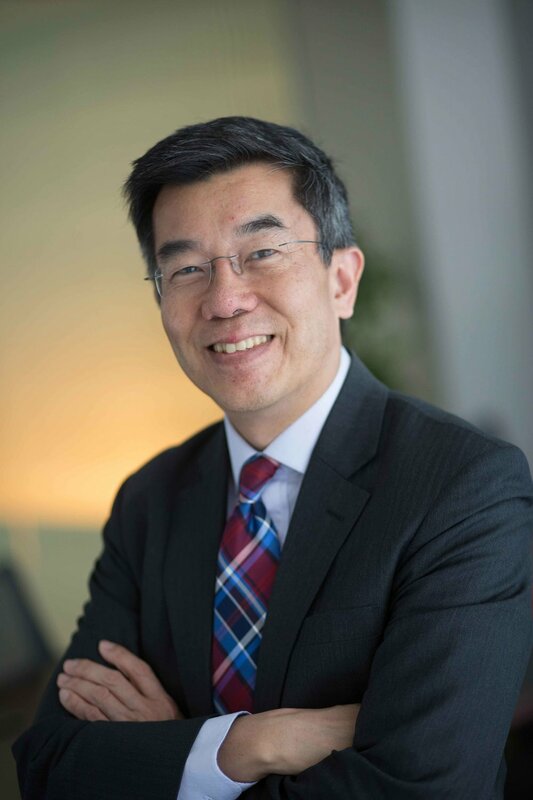 This intends to focus research and innovation on areas where Johns Hopkins University is best positioned to harness its expertise to make impact. These priority areas include: food & nutrition security, healthy environments, gender equity & justice, and transformative technologies & institutions. Each thematic area addresses underlying issues that exacerbate health inequity around the world. They are also connected to each other; the AHW will support work both within and especially across thematic areas. The four priority areas are introduced below. Over the next few months, we'll also take a closer look at each; in this article, we focus on Healthy Environments, its importance and how it interfaces with other thematic areas. The Food & Nutrition Security team focuses on linkages between food systems and environments, and dietary diversity and quality to maintain nutrition and health in an era of rapid urbanization, globalization and growing inequality. Their research integrates perspectives and methods from public health, nutritional sciences, food security and agriculture, ethics and economics to address nutritional inequities in underserved communities worldwide. The Healthy Environments team explores how the impacts of global climate change and environmental degradation compounds inequalities in people’s health and nutrition. Their research identifies and promotes mitigation strategies to reduce carbon emissions and their harmful effects on the environment and health, particularly in poor and marginalized communities. The Gender Equity & Justice team examines impacts of gender-based power disparities, oppression and discrimination on health equity. Their work develops, implements and evaluates initiatives to advance gender equity and justice for more healthy, peaceful and prosperous societies, and to train the next generation of leaders. The Transformative Technologies & Institutions (TTI) team explores ways to design, market, produce, deliver and support health care services and products, emphasizing quality of care and incorporating efficient use of resources. 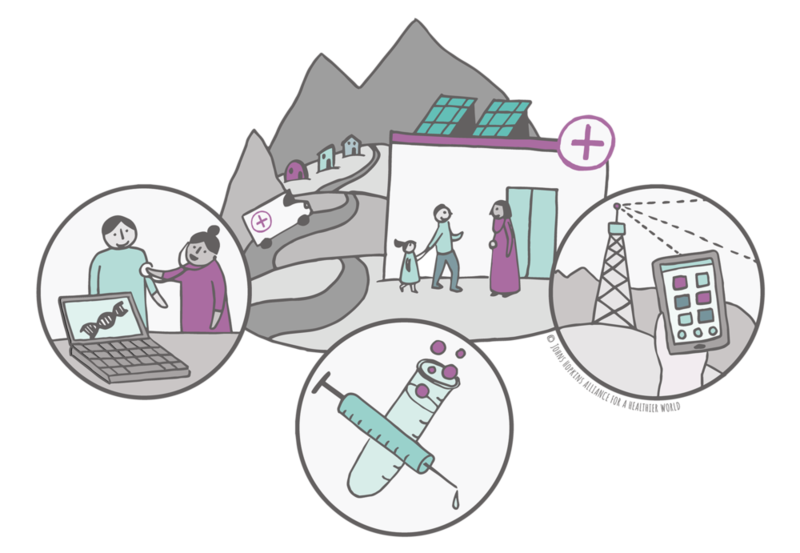 They apply community perspectives and systems thinking to improve processes, infrastructure and institutions that fosters successful new technologies for reducing health inequities. For healthy people, we need a healthy environment. The air we breathe, the water we drink, the climate, and the soil in which we grow food all affect our health. Many diseases, conditions and challenges in quality of life stem from environmental conditions. Climate scientists have well-documented that global environmental change – encompassing changes in climate, ecosystems, biodiversity, hydrological systems, food systems, and water quality – are being felt at local and global levels. Healthy Environments, like other AHW thematic areas, cut across many fields and require multidisciplinary collaborations to understand and find solutions for fostering environments conducive to good health. This challenge calls for multiple, purposeful actions to assist communities most impacted by inequities that result from environmental degradation and accumulating greenhouse gases. Sustainable and readily adoptable alternatives for reducing indoor and outdoor air pollution and their impacts on health. For instance, clean cookstoves use less fuel and reduce emissions – and in turn, reduce the burden on women and children for accessing fuel, as well as reduce their exposure to the harmful emissions, unlike traditional cookstoves. The Alliance recently funded pilot research to improve the technology of cookstoves to be cleaner, healthier, and affordable. Another funded research team is using community-based participatory approaches to plan actions for asthma treatment in Lima, Peru. Further details on these research awards are available here. Retrofitting existing health facilities, particularly in hard to access areas, to be more self-sufficient. The Healthy Environments team will examine ways facilities can adopt clean energy, access and manage water and more efficiently use resources. This approach integrates with the Transformative Technologies & Institutions thematic area. Understand and intervene in health, nutrition, and agricultural impacts of degrading land in fragile regions. Rising sea levels are spilling saltwater onto agricultural lands, and as a consequence, changing the soil’s salinity level to a point where it becomes difficult, if not impossible, to grow produce. Coastal Bangladesh is an example of a fragile region where agricultural impacts also affect health and nutrition for a large population. This focus will work in tandem with the Food & Nutrition Security thematic area. Develop new program models for combining community health and environmental sustainability. Poor communities are more likely to live in precarious and unhealthy environments, and have fewer resources to devote to adaptation approaches to be resilient to a changing environment. The Healthy Environments team will examine and identify gaps in existing models and develop new or enhanced approaches for addressing these challenges. Closer to home, Winch looks to collective actions by the entire Johns Hopkins community. The university’s Office of Sustainability as been implementing projects and educating faculty, staff and students to reduce the university’s carbon footprint. The Center for a Livable Future has been taking a holistic approach to the environmental and health impacts of food production and consumption. The Bloomberg American Health Initiative supports training and leadership for practitioners and researchers focused on environmental challenges and other areas affecting the health of Americans. The Alma Ata 40 Campaign is an effort led by David Bishai, Professor of Population, Family and Reproductive Health at the Johns Hopkins Bloomberg School of Public Health to reinforce the value of primary health care, an approach recognized as vital in the Health For All, Alma Ata Declaration of 1978. This month, Dr. Winch describes the ways the Alliance’s thematic areas, including Healthy Environments, draw from international voices such as the Alma Ata Declaration. Winch and team hope to build on these successes and strengthen Johns Hopkins’ collective knowledge and motivations for a series of actions to promote healthy environments for all, particularly for those who have been marginalized politically, socially and economically. Peter Winch is the Thematic Leader for Healthy Environments at the Alliance for a Healthier World (AHW). As Professor in the Social and Behavioral Interventions Program in the Department of International Health at the Bloomberg School of Public Health, he teaches courses on qualitative and formative research and applied medical anthropology. His work aims to: 1) improve the health of mothers and children in areas where access to health facilities is poor or non-existent, and 2) develop and evaluate behavior change interventions and health system responses to global environmental threats. As we focus future efforts on addressing health equity in low-and middle- income communities, there is value in reflecting on past approaches to health care for the world’s most disadvantaged people. Newly independent countries were emerging in mid-twentieth century – and along with new governments also came the need for new infrastructure, including health care. By the 1970s, the public health field recognized that Primary Health Care (PHC) was not being served or accessible to where many people live and work. Enter the Alma Ata Declaration, which urged governments, health and development workers, and the world community to protect and promote the health of all people. To achieve the vision of Health for All, the Declaration advocated decentralizing power and decision-making away from government offices in the capital city and away from doctors and nurses providing care in hospitals, to the people at the grassroots level. In 1978 when the Declaration was adopted, Primary Health Care meant working with community members to take stock of their health and living conditions, and by taking maximum advantage of the commitment and skills of local people to achieve health. Now in 2018, in an era of global climate change and environmental degradation, it is no longer sufficient to empower local people to take action locally as a standalone approach. The Commission on Planetary Health, led by The Lancet and Rockefeller Foundation, took the Alma Ata Declaration a step further with their Planetary Health program. They are investing in a new multidisciplinary field that incorporates global and local-level action to improve health and wellbeing of low-income communities and to reduce consumption by wealthy communities – all while also maintaining ecosystems and biodiversity for future generations. Primary Health Care that incorporates Planetary Health must also work to reduce global consumption of fossil fuels and other resources, reduce the environmental impacts of food production, maintain ecosystems and promote biodiversity. For health systems, this means continuing to work toward decentralizing decision-making, empowering local stakeholders, and localizing health system inputs such as energy, construction materials and food. This expanded concept of Primary Health Care is summarized in the following table. It animates and informs the work of several thematic areas in the Alliance for a Healthier World, particularly for the Healthy Environments area. Primary Health Care in a Changing World © Peter Winch/Alliance for a Healthier World. We are rapidly approaching the 40th anniversary of the International Conference on Primary Health Care held in September 1978, and that issued the Declaration. Carl Taylor, the Chair of the Department of International Health at the Johns Hopkins School of Public Health at the time, played a major role in drafting the Alma Ata Declaration. Currently, Johns Hopkins faculty and students are spearheading a working group, the Alma Ata 40 Campaign to mark the anniversary in September 2018, and renew collective commitment to the vision of health for all and health equity enshrined in the Declaration. The global health community will mark the 40th anniversary of the Alma Ata Declaration with a conference on Oct 25–26, 2018 in Almaty, Kazakhstan. Editor's Note: This article is the first in a series we’ll publish about the Health for All principles underpinning the Alma Ata Declaration and the roles that all members of the Johns Hopkins community can adopt to help achieve its vision. Dalglish SL, Poulsen MN, Winch PJ. (2013). “Localization of health systems in low- and middle-income countries in response to long-term increases in energy prices.” Globalization and Health. 9:56. United Nations Environment Programme. (2012). Global Environment Outlook: Environment for the future we want. Progress Press. Whitmee S, Haines A, Beyrer C, Boltz F, Capon AG, de Souza Dias BF, Ezeh A, Frumkin H, Gong P, Head P, Horton R, Mace GM, Marten R, Myers SS, Nishtar S, Osofsky SA, Pattanayak SK, Pongsiri MJ, Romanelli C, Soucat A, Vega J, Yach D. (2015). “Safeguarding human health in the Anthropocene epoch: report of The Rockefeller Foundation-Lancet Commission on planetary health.” The Lancet. 386(10007): 1973-2028. Peter Winch is the Theme Leader for Healthy Environments at the Alliance for a Healthier World (AHW). As Professor in the Social and Behavioral Interventions Program in the Department of International Health at the Bloomberg School of Public Health, he teaches courses on qualitative and formative research and applied medical anthropology. His work aims to: 1) improve the health of mothers and children in areas where access to health facilities is poor or non-existent, and 2) develop and evaluate behavior change interventions and health system responses to global environmental threats. The Food & Nutrition Security team identified gaps and highlighted opportunities for future multidisciplinary research. Dr. Nancy Glass and her team has developed myPlan, an app and online tool for survivors of intimate partner violence to access information and make decisions to improve their safety. Communication barriers have long been a challenge for health professionals worldwide to effectively help women facing intimate partner violence (IPV) and sexual violence (SV). To address the significant health impact of these conditions, the World Health Organization (WHO) recently developed guidelines for the health care response to IPV and SV against women, with an accompanying clinical handbook. Jess Fanzo, lead for the Alliance's Food & Nutrition Security group, is involved with the launch of a valuable new resource - this year's Global Nutrition Report - launching November 4, 2017. The Alliance for a Healthier World is thrilled to share information about an exciting new scholars program available to students from all JHU divisions. Global Healthy Equity Scholars will conduct research, lead student group events, and facilitate interactions between experts from several disciplines. Applications for 2017/2018 GHES are due by mid September, 2017.